Catching the Bus is easy with a little practice! Please review the maps and schedules to find out which bus serves your area and how to get where you want to go. 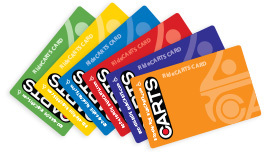 Passes can be purchased inside CARTS stations. Please have your exact fare or bus pass ready when the bus arrives. Drivers do not carry change. If you need to travel on more than one route, ask your driver for a transfer as you depart. For all Fixed Route services including: the Interurban and Municipal buses will arrive at major stops at the times indicated in the timetable. We suggest you arrive at your stop five to ten minutes early. The route number is displayed on a large marquee sign above the driver and along the side of the bus. Where as the Country Bus, also known as our curb to curb service is a shared ride and passengers should be ready for pickup 15 minutes before the scheduled pick up Pick up time is within our general slots of availability and reservations are made by phone. All buses are equipped with bike racks so you can bike to the bus, store your bike while you ride, then bike to your destination! When the bus pulls up to your stop, just tell the driver that you’ll be securing your bike to the rack and the driver will wait for you. Then board and pay your fare. When you get off the bus, be sure to tell the driver you'll be removing your bike. For the comfort of all passengers, smoking, eating, drinking, chewing tobacco or using illegal substances are prohibited while riding the bus. Please use a headset when playing an audio device, and keep the volume low so that others are not disturbed. Be considerate of other passengers when using personal communication devices. Keep the conversation brief and your voice low. Limit your conversation with the driver to questions regarding services only, so the driver can focus their attention on safe driving. A driver may refuse to transport a passenger who appears to be under the influence of alcohol, illegal or dangerous substances, or whose behavior or language appears abusive, offensive, disorderly or dangerous to himself, the driver or other passengers. Please give your seat to any person who, because of age or physical condition, is less able to stand or move to the rear of the bus than you are. For the safety of all, passengers shall not place articles in the aisles. Place articles in your lap or under the seat. Please do not leave trash on the bus. Only service animals that have been trained to assist an individual in living independently are permitted on board. Pets in approved crates or animal carriers can ride with passengers only if they are being transported to the veterinarian. Strollers are permitted but must be folded before boarding the bus. Drivers may ask riders who do not observe the rules to leave the bus. What do I do if I left an item on the bus? Do you provide services for seniors or person with disabilities? 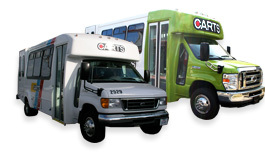 All of our buses and vans are wheelchair accessible. When scheduling service, mention that you need this type of service. Also mention any type of assistance that you might need or if someone will be traveling with you to assist you. For more information, please visit our Disability Transportation page. Our fares vary in prices. To find how much a specific service costs, please visit our Fares page. Where can I find a schedule and a printed map? To learn more about our schedule, please visit our Maps & Schedules page.